1944 torpedoed and sunk in English Channel. 63 (4 dead and 59 survivors). Completed in March 1914 as Etonian for Cambrian Steam Navigation Co Ltd (J. Mathias & Sons), London. 1918 renamed Clan Keith for The Clan Line Steamers Ltd (Cayzer, Irvine & Co Ltd), London. 1921 renamed Hilarius for British & South American Steam Navigation Co Ltd (R.P. Houston & Co), Liverpool. 1923 returned to previous owner and renamed Clan Keith. 1937 renamed Orminster for Minster SS Co Ltd (Thomas Eeles & Co), London. 1940 sold to South American Saint Line, Cardiff. 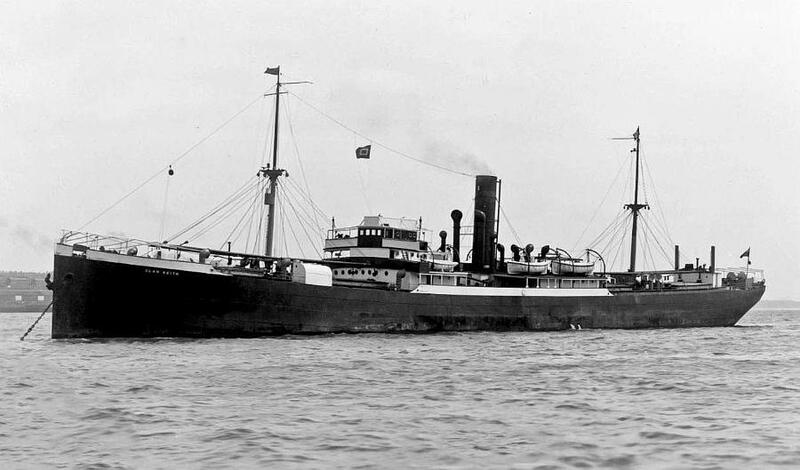 At 14.43 hours on 25 Aug, 1944, the Orminster (Master Harold Gittins), a straggler from convoy FTM-74, was torpedoed and sunk by U-480 about 35 miles northwest of Cap d’Antifer. One crew member and three gunners were lost. The master, 43 crew members, 14 gunners and one army storekeeper were picked up by HMS Pennywort (K 111) (T/Lt W.P. Hart, RNR) and HMS Damsay (T 208) and landed at Portsmouth.